We are so excited to welcome Boffo Cart to the MCM family! Ever since they started serving dinner at the market a couple of weeks ago, customers have been raving about their food. Boffo Cart offers its own version of seasonal, California-style Italian fare, using organic, local ingredients from a variety of market vendors from around the Bay. For his calzones, Chef Rhasaan Fernandez makes his own completely vegan dough (which is insanely delicious! ), with flour milled every day in San Francisco, and he serves his sandwiches on Acme bread. Rhasaan, who grew up right in the Mission blocks from MCM, loves to get out of the restaurant setting and interact directly with customers. “Let the food speak for itself, and let me speak to the people,” he said, when I talked to him about why he likes working at markets. He’s owned and operated Sam’s Log Cabin in Albany for the past few years, but Boffo Cart offers an outlet for a different style of cooking and serving food. 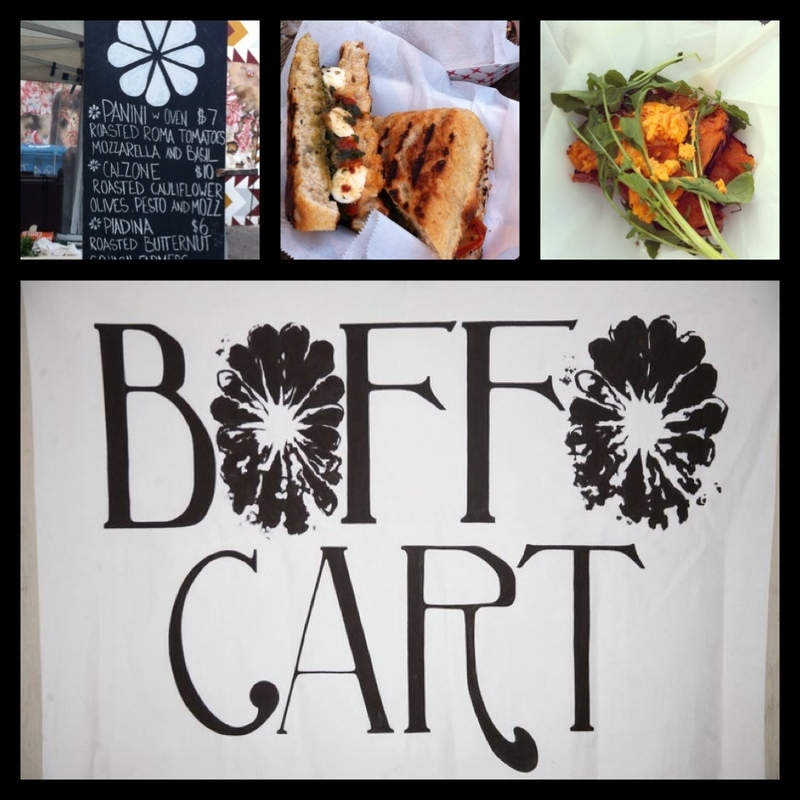 Boffo Cart’s food certainly does speak for itself, with specialties including veggie calzones, porchetta sandwiches, pesto squash piadinas (flatbread with delicious fixin’s inside – almost like an Italian taco), roasted sweet potatoes with melted Sriracha butter, and more! Last week, they offered a roasted roma tomato, pesto, and mozzarella sandwich on thick, focaccia-style bread that was absolutely to-die-for. While Boffo Cart usually carries one item at MCM for meat lovers, they consistently offer a variety of tasty veggie options that are flavorful and hearty, so vegetarians and meat-eaters alike can enjoy them! Wondering about that name, “Boffo”? Well, apparently the term is moxie-era slang used to describe something sensational. We definitely believe that the offerings at Boffo Cart are quite sensational, and we hope you agree! You don’t want to miss dinner from Boffo Cart – check them out this week at MCM, 4 pm til 8 pm.